Chase Reynolds did a pretty extensive lens comparison between 13 lenses for his Sony a7RII, a7SII, a6300 and out of all the lenses tested the Sony FE 55mm f/1.8 and the Zeiss Loxia 50mm f/2 Planar rose to the top for Chase. My personal favorites for an autofocus lens and manual focus lens are the Sony Planar T* FE 50mm f/1.4 ZA and Leica 50mm f/1.4 Summilux-M ASPH, but everyone has their own preference. There are so many great lenses today. 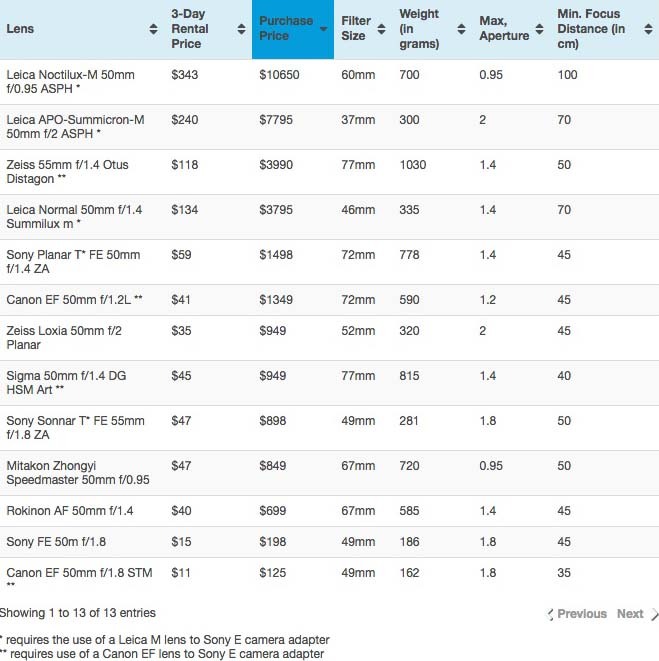 Be sure to check out The Ultimate 50mm Lens Comparison at Lens Rentals and pick your favorites. This entry was posted in Sony a6300, Sony a7R II, Sony a7S II and tagged Leica 50mm f/1.4 Summilux-M ASPH, Sony FE 55mm f/1.8, Sony Planar T* FE 50mm F1.4 ZA, Zeiss Loxia 50mm f/2 Planar. Bookmark the permalink. Trackbacks are closed, but you can post a comment.